The first DPACE meeting was held at the European Space Astronomy Centre (ESAC), Villanueva de la Cañada, Madrid, Spain. From left to right: Claude Huc (CNES), Laurent Eyer (Observatoire de Genève, Switzerland), David Katz (Observatoire de Paris-Meudon, France), Floor van Leeuwen (Institute of Astronomy, Cambridge, UK), Coryn Bailer-Jones (Max-Planck-Institut für Astronomie, Heidelberg, Germany), Ulrich Bastian (Astronomisches Rechen-Institut, Heidelberg, Germany), Fred Jansen (ESA), Xavier Luri (University of Barcelona, Spain), Dimitri Pourbaix (Université Libre de Bruxelles, Belgium), François Mignard (Observatoire de la Côte d'Azur), Ronald Drimmel (Turin Astrophysical Observatory - INAF), William O'Mullane (ESA). The list of current DPACE members can be found here. 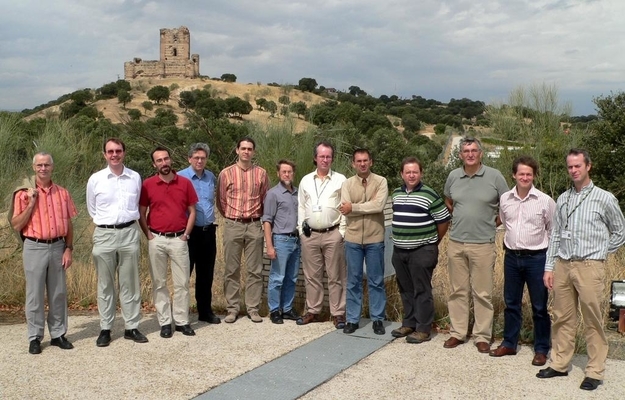 The castle in the background is Castillo de Aulencia, also known as Castillo de Villafranca.